From time to time, the hard drives may develop some issues which may interfere with their functionality. These include viruses, corruption of the various software, malware, code issues, and alteration of the storage mechanisms, to mention but a few! At such times, formatting the external hard drives would make more sense than using other intervention measures to rectify those problems. For a start, formatting a hard drive simply means deleting all the existing files in that drive and then setting up a new file system. The aim of the process is to prepare the drive for subsequent use by an operating system. It may also serve to restore the proper functioning of the drive after infestation by a virus or a malware. The manner in which this is done depends largely on the operating system in use. This is because different operating systems have their own prescribed methods to carry out this chore. Any failure to follow the due process may often lead to permanent damages of the hard drives altogether. We are going to examine how to go about the issue via the three major operating systems in existence today. These are the Windows, Chrome and Mac Operating systems respectively. As stated, the exact method of doing this largely depends on the specific operating system which is in use. This is why we have seen it necessary to break down the procedures on the basis of the three main operating systems in vogue today. These are the Mac OS, the Windows OS, and the Chrome OS, respectively. Windows is by far the most widely used operating system. As such, it is necessary to know how to format a hard drive via it given that in most instances, you will have to do while using a computer on which it is installed. Step I: Start off by plugging your external hard drive into the computer. You may also plug it into a wall outlet if necessary or if the prevailing circumstances so dictate. Plugging the external hard drive will make it detected by the machine and visible to you from the list of menu. Connecting it to a power source, on the other hand, will enable it to function as need be. Step II: Open the Windows Explorer, then click the ‘Computer’ section which is located in the sidebar to locate your drive. Scroll down to access your file if it does not appear at the top. Chances are that the many file systems may overshadow it and make it invisible. Step III: Right-click the selected drive and then select ‘Format.’ This process is generally faster and takes minutes only. Clicking format will bring about the ‘Format’ dialog box which shall give you the various options to proceed further. Step IV: Under the ‘File System,’ select the file system you are interested in. If you do not see this particular file, consider removing some of the peripherals that are attached to the device. This will leave yours more visible by ranking it at the top of the list. Step V: Assign a name to your new drive under the ‘Volume Label’ and then tick the ‘Quick Format; option box. Needless to say, the name should be unique. This is necessary so as to prevent any clashes with the data or files that have already been stored in your computer. Unique names are also easier and faster to retrieve. Step VI: Click ‘Start’ in order to format the drive. You will receive a notification when the task is completed. This should ideally take only a matter of seconds. However, if the RAM of your computer is overwhelmed with files, the system may slow down and take longer than is ordinarily the case. Whatever happens, just be patient. As soon as you are through, open that particular drive in the Windows Explorer and proceed to drag files to it. You may also consider backing up the files on your computer. To be more effective, you may choose to highlight as many files at a time as possible. Thereafter, proceed to copy and paste the files into their new destinations. NB: When you format the drive, it will not display the exact amount of free space as it does on the box. This is due to the differences in the measurements between the computer and the software companies that market the products. The Mac operating system is the one that is used in all Apple products and especially the laptops. Given the extreme popularity of these products, it pays to know just how to format an external hard drive using the Mac operating system. Such knowledge is, by all means, vital as to forestall unnecessary inconveniences that do come along whenever such problems arise. Step I: Open the ‘Finder’ and then proceed to ‘Applications’ and then to ‘Disk Utility.’ Double click the ‘Disk Utility’ to generate a dialog box. This dialog box has the details and the options necessary to take further courses of actions. Step II: In the dialog box, select the specific drive you are interested in from the left-hand sidebar and then proceed to the ‘Erase’ tab. This tab is what has the instructions and the actions to be taken to actualize the formatting process. You will find the ‘Format’ menu in the ‘Erase’ tab. It is this one that is necessary for the process of formatting the external hard drive. Step III: Click the ‘Format’ menu on the ‘Erase’ tab. Under the ‘Format’ menu, select the file system you are interested in utilizing. This system definitely has to be compatible with the external hard drive you want to format. 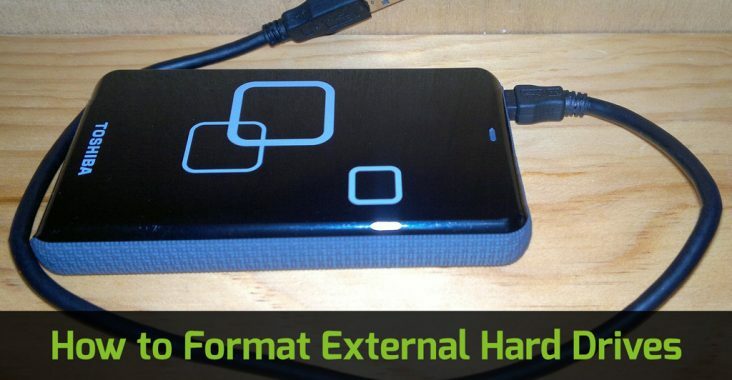 Be sure to ascertain the file format of the specific external hard drive you intend to format. You will save a lot of time and also do a comparatively good job in the process. Step IV: Assign a name to the drive and then click the ‘Erase’ button. It goes without saying that the name should be unique and not used anywhere else. You definitely want to avoid clashes and inconsistencies by assigning the same name to quite a number of files at a time. This should take only a matter of seconds to accomplish. Your drive is now formatted. Step V: As soon as you are completely through, click the particular drive in the ‘Finder. ‘Proceed thereafter to drag files into this particular drive. You may also consider setting it up as a backup drive using the Time Machine. NB: Mac OS is generally vulnerable to too much load. This is why it is a wise decision to mute or freeze every other activity while formatting the external hard drive. This way, you will get to hasten the process of formatting and prevent any unnecessary interferences in the process. Though a recent entrant into the field of operating systems, Chrome Operating System is increasingly becoming acceptable and adopted by a computer user. Its main strength lies in the facts that it loads faster and also works well in most kinds of electronic devices and computers. By far the most significant device wherein it is used is the Chromebook. Step I: Start off by plugging your external hard drive into one of the USB ports of your Chromebook. You are advised to detach all the other peripherals from the Chromebook for the sake of efficiency and elimination of any errors. This is because many attachments will often confuse you as to the one that is most applicable to your case. Step II: Open up the file apps which is symbolized by the blue folder icon. While at the navigation sidebar, identify your specific device. This is particularly necessary if you have more than one device connected to the Chromebook. Be sure to ascertain that it is the correct one before going on with the entire process. Step III: Right-click the particular drive you intend to format and then proceed to select the ‘Format Device’ option from the various options that are on the menu. Keep scrolling down if you do not see your own device on the list. You may also wish to remove some of the peripherals that are attached to the Chromebook. Step IV: The Chrome Operating System will prompt you to confirm that you indeed intend to format the external hard drive. Proceed to click ‘OK.’ The operating system shall proceed to format the external hard drive. This should not take too long to actualize especially if the size of the hard disk is no more than 2GB. You will, however, be patient while handling larger storage sizes because it takes longer to do so. Step V: When you are done formatting, a small toast shall appear in the lower right-hand corner. This is a sign that the task has been accomplished successfully. If this small toast does not appear, chances are that there are issues with your computer system. You may attempt to troubleshoot the system for further diagnosis. NB: Devices on the Chromebook are formatted to the FAT32 file system. This system is the most versatile, widely supported, and support by reading and writing resources. It also works across several operating systems and devices like smartphones and digital cameras. One of the worst downsides of this file system though is that the stored data may be fragmented at any time. Such a move may often impact the physical storage components adversely especially if it happens over and over again. This diminishes the reading and writing speeds with time. It is not enough to know the various ways and means of how to format an external hard drive via the three main operating systems. You definitely want to go ahead and put the knowledge you have received in practice. This can only happen if you identify your operating system and then proceed to follow the procedures we have stipulated above. Definitely, you are not the only one who has need of the information we have explained above. Chances are that there are some others around you who are in need of the information as well. It is therefore wise to share this information with as many others as possible. This will let them enjoy the same benefits we have stipulated above. All the best as you contemplate taking the first major step to this end!